Park is the genius behind Oldboy, and I’m not sure what else needs to be said. If you haven’t seen this South Korean director’s mesmerizing masterwork, make watching it a priority, as long as you enjoy challenging, foreign, subtitled, Korean, horror/action/thrillers that force you to think of terrible things and force you to watch worse. And, writing that down, it seems like an absolutely terrible recipe for an enjoyable movie, but that’s what makes Oldboy great; it comes completely out of nowhere to smash you in the face with a cinematic hammer. Spike Lee attempted a Josh Brolin remake ten years later and failed miserably, highlighting further the talent of Park and the difficultly this strange style poses. And if there was any doubt left, The Handmaiden just blew it away, as it is yet another stunning instant-classic from Park that will cement his name in my mind forever and could very well be one of the Top 5 films of 2016. The Count, a Korean swindler posing as a Japanese uppercruster, recruits Sookee, a young pickpocket and general thievery expert, to help him pull off the con of the decade, which will make them both rich in the process. The Count is attempting to woo the wealthy Lady Hideko, the niece and ward of the very unusual bookdealer Uncle Kouzuki. Kouzuki means to marry Hideko and take her fortune, but the Count wants to get there first. With the help of Sookee, and after inserting her as the Lady’s maid, the Count thinks he can convince Hideko to fall in love, run away with him, sign over half her inheritance, following which he will have the Lady committed into a mental hospital. Sounds like a plan, though a devious one, and at first all goes swimmingly. But you know what they say about best laid plans, and the frailty of human loyalty will soon be put to the test, as emotions get in the way & unspeakable secrets are revealed. Some films are almost impossible to describe without giving too much away, but I’ll try to walk that fine line with this review, as best I can. First, this isn’t a movie for everyone. As I described Oldboy earlier, Handmaiden is an odd mesh of styles and elements that really should not work together, but somehow do to unique perfection. A beautiful South Korean film set mostly in a mansion in the 1930s, there’s a period piece element here to be enjoyed, and a romance deep within the plot that should be appealing as well. But at the same time, this is horror, this is thriller, this is artistic expression, and this is blatant sexuality, often to what will be for many an uncomfortable level. So while I want to recommend this film to all, and while I think it is definitely one of the strongest of the entire Oscar season, I have to at least warn potential audiences that boundaries will be broken. The absurdity of these characters and the twisted nature of the plot are both highly entertaining, but what got me was the manner in which the story was told, not exactly a gimmick, but definitely not normal fare. 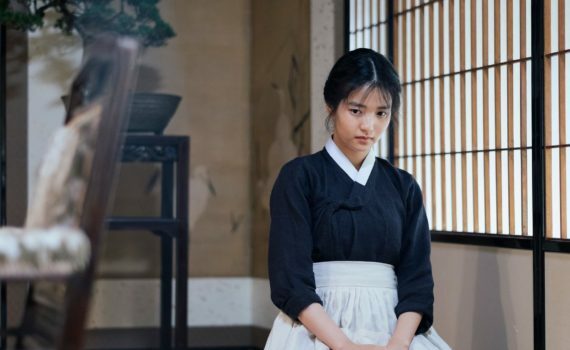 We see things from the handmaiden’s perspective first, this sordid con, the way she feels toward her lady, the potential problems, and the movie is fairly typically if spectacularly done. But then things get weird, and we start to see things from upside down, from a much more depraved vantage point that casts an entirely new light on what we’ve already seen. If you don’t believe that this film is violent & sexual after the first 45 minutes, just wait, it’s coming. The Handmaiden turns out to be an odd but wonderful combination of Oldboy, Bound, Lust Caution, and Nymphomaniac, movies that all deserve you attention. I don’t mean to suggest that it borrows too much, far from it, but rather that it takes elements from so many and melts them together to form something both frightening and fantastic. I don’t know what awards this film will be eligible for or what it could win, but in my book, or rather my iPhone, it ranks right up there with the best of the best of the year, something impactful, interesting, and awesome that I did not anticipate.